It's been a whirlwind week, with a full schedule I could only spend one hour in the antique store. Yet amid the chaos I'm managed to schedule time for constructing grab bags, fun sets, and small merchandise for my booth. These picnic sets are my latest creation. Got an individual basket that won't sell? Set of plates hasn't moved for months? I theorize combining like-items into a whimsical gift set will help you make those sales and clear out some stock all while providing cute and practical merchandise. Thank you Thrift Boutique for reminding me via the Facebook page that Betty and Don Draper used a basket like mine. I printed this scene and added it to the baskets. Carla suggested via Facebook this set would make a great gift for newlyweds! Great idea! By the way, I appreciate the feedback and valuable data you all give me via Twitter and Facebook- thank you. You save lots of research and make my work day a lot funner! I'm glad to have you Twitter Pals around. 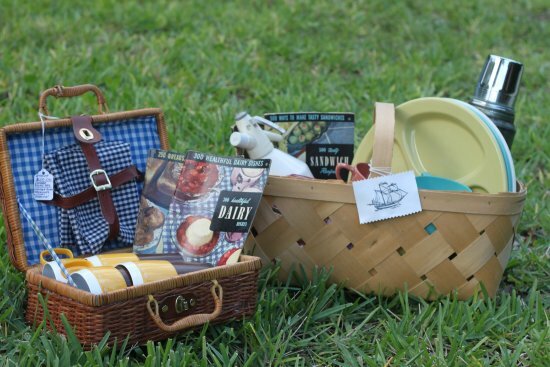 I'll be crafting more interactive sets full of vintage surprises for the booth behind-the-scenes and these picnic baskets are premiering in Southern Crossing Antique Mall today. I think they're awesome, so they better sell quickly! What do you think of these sets, have they charmed the pants off of you yet? By the way, as you read this I'm on the way to the Florida Keys! I'll update you all on this development tomorrow! Would you like me to write about thrift and antique stores I encounter down here? They are fab, beautiful idea!! 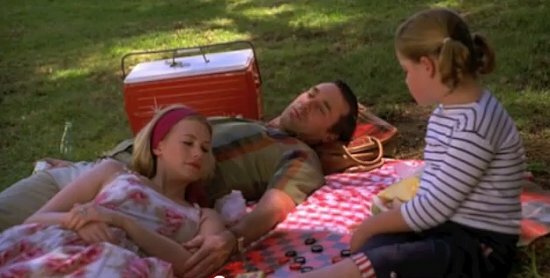 That is an awesome idea on the picnic baskets! Miss Lou: Thank you, next I'm going to make some as gifts! super cute, i love these! 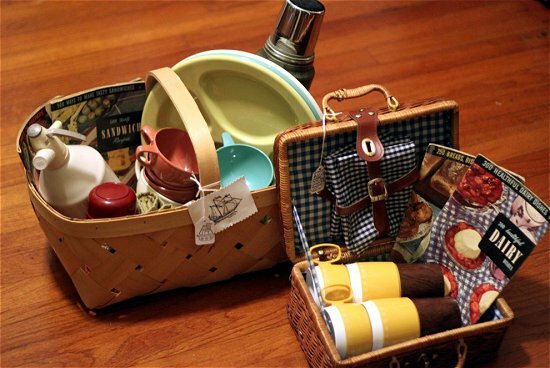 Very retro picnic baskets - so cool! I bet they won't last long in your shop. Lisa: Try it, and good luck! Tammy: I hope they won't! 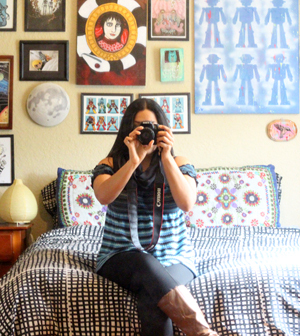 Mitzi Curi: You're welcome, good luck with your sales and constructing kits of your own!